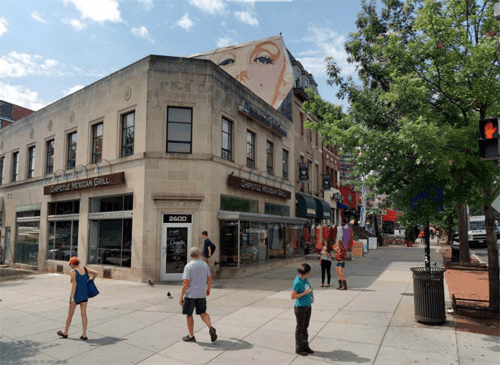 The Woodley Park Neighborhood Mixed-Use NC-4 Zone is located in the vicinity of the Woodley Park Metrorail Station on non-residentially zoned lots at the intersection of Connecticut Avenue and Calvert Street, N.W. Encourage a scale of development and a mixture of building uses that are in general compatible in scale with existing buildings in the Woodley Park neighborhood. The NC-4 zone is intended to permit mixed-use development at a moderate-density. 1 Except as prohibited on the roof of a detached dwelling, semi-detached dwelling, rowhouse, or flat in Subtitle C § 1500.4.